History: Why a New Transportation Plan? About 2040 & BeyondManaging GrowthHistory: Why a New Transportation Plan? This forward-looking plan for Washington reflects the diversity and complexity of our communities, regions, economies, and lifestyles from one end of the state to the other. It builds on the work that has gone before and helps ensure that the countless individual decisions and investments made at every level of government continue to advance our statewide goals. We have a long history of coordinated transportation planning in Washington state. There are hundreds of transportation plans in place right now or under development —from local, regional, transit, tribal, and state governments—each with its own role in making transportation work for Washington. It’s a messy-looking process on paper but it works surprisingly well, given that the statewide transportation system includes everything from multimodal pathways to international shipping hubs. The majority of those plans are coordinated with bigger comprehensive land use plans for community or regional growth, or to support specific economic, social, or environmental initiatives. From long-range policy and modal plans to short-range implementation plans, multi-disciplinary corridor and subarea plans to intersection plans and paving programs, from six-year improvement programs to congestion management tolling plans, and industry leading research and sector studies on every aspect of mobility, there is a plan for every part of Washington’s transportation system. This statewide policy plan is one part of that coordinated planning process. It does not duplicate the individual plans and implementation recommendations. 2040 & Beyond takes the opportunity to challenge our thinking about the next 25 years. It sets the table for policy discussions on emerging, cross-cutting topics that have implications all across the state—how to better accommodate transformative technologies and other innovations in the ways we plan for and provide a highly functioning transportation system, and what resilience means in an era of climate change, extreme weather events, and natural disasters. It builds on the Commission’s recent work about how to pay for transportation and poses core questions that will inform the evolution of transportation funding in Washington state for the next few decades. Importantly, it deliberately sets out to break down some of the silos in our thinking about statewide transportation policy and other community goals, better reflecting the way transportation works in the real world. The statewide policy plan provides the overarching framework of statewide goals needed to ensure consistency among those other plans and helps Washington to meet its statewide transportation policy goals established by the Legislature. Maintaining consistency with goals and policies in the Commission’s statewide policy plan helps ensure that all of those local, regional, and state plans are also consistent with each other. 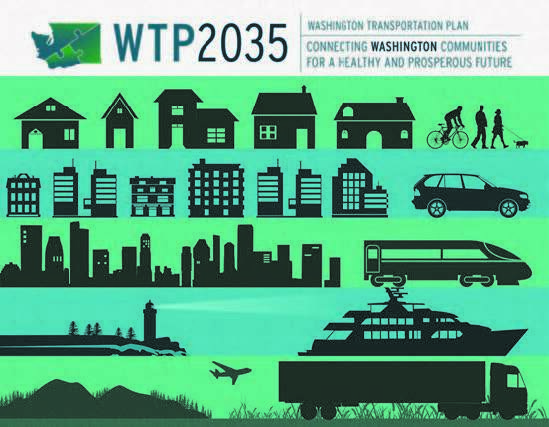 2040 and Beyond is a refresh of the 2035 Washington Transportation Plan (2035 WTP) adopted by the Commission in January 2015. That plan was based on a solid planning foundation rooted in this state’s long-standing commitment to growth management and coordinated transportation land use decision- making. It reflected the commitment of state and local transportation departments working to deliver an integrated multimodal transportation system that meets the needs of all users.